In an article for CNN, Dr. David King, a senior lecturer at The University of Queensland, wrote about this annoying medical phenomenon. When it’s cold out, it’s your nose’s job to warm up the air you breathe in before sending it down to your lungs so they don’t get irritated. On top of that, the nose secretes extra mucous in order to add moisture to the cold, dry air coming in. This results in an estimated loss of up to 300 to 400 milliliters of fluid through your nose. Heating the air in the nose means that the mucous that lines the nasal cavity becomes cooler than your body temperature while water evaporates to make the air you breathe in moist. As a result, your nose gets colder because water evaporation uses up a lot of heat. Blood flow to the nose then increases to help it stay warm. “When the compensatory mechanism is a little too overactive, moisture in excess of that needed to humidify this cold, dry air will drip from the nostrils,” King writes. 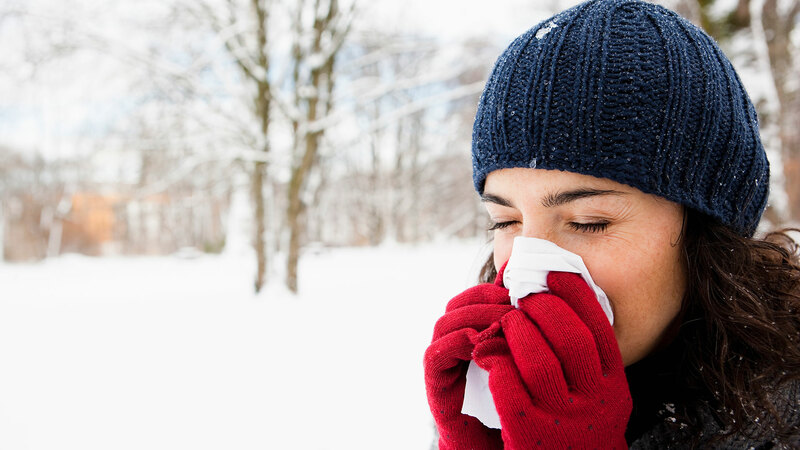 Those who have asthma, eczema and hay fever tend to experience cold-weather runny nose more, King writes. And the cold weather can trigger nasal congestion and sneezing. Because this is weather-related, it’s not something that needs to be treated with medication — just don’t forget the tissues.